I love making meals that are more fun for Baby Digger like fun shaped cut cold cuts, fruits and cheese! So, when I saw this Mickey Mouse Toaster at Brylane Home I knew we had to have it! It comes with 2 stencil plates, one of Mickey Mouse and one of Minnie Mouse, that will transfer the characters right onto your toasted bread. It even comes with a neat retro storage box that can also be used as a bread box if you’d like. The toaster is a matte black with stainless accents with Mickey Mouse embossed in, so no matter the decor in your kitchen it will go with it. The toaster features different settings so you can toast your bread as little or as much as you’d like. It also has a nice reheat and defrost features. The reheat feature really comes in handy when you get sidetracked after your bread is ready, which happens to me a lot! The stencils are easy to place in each bread slot and then you just pop in your bread and start the toaster. It toasts the bread nice and evenly and leaves the Mickey and Minnie Mouse silhouettes on the other. It’s a really cool toaster and Pinky likes her Mickey bread! I’m working on mastering the best temperature setting to get the best stencil outlines. Sometimes it can be a bit hard to tell what the silhouettes are if you leave the toast in too long. I love this toaster because not only is it fun but it doesn’t look like a novelty toaster so I can keep it in my kitchen all the time. It’s easy to use and I also love the crumb tray underneath that is easy to pull out and clean! The Limited Edition Mickey Mouse Toaster With Bread Box is available at www.BrylaneHome.com on sale now for $59.99 Regularly $99.99. 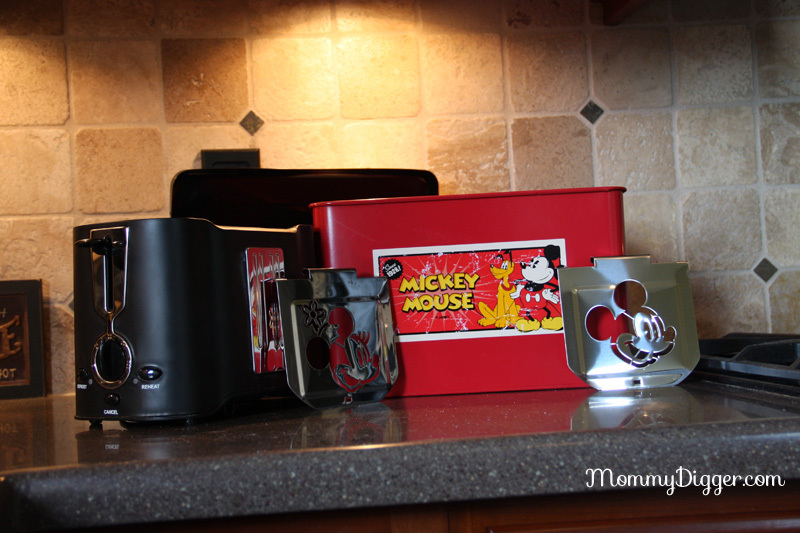 One Mommy Digger reader will win a Limited Edition Mickey Mouse Toaster With Bread Box! To enter, fill out the rafflecopter form below. Ends 8/27 at 11:59PM EST. Big Disney fan here! I’d love this!